At the time of writing, Jesse Ryder is fighting for his life after a completely cowardly and baseless attack by a group of terrible individuals. It is a dark day in international cricket, and it is not the first. One of the alleged and completely senseless reasons behind this is that it was possibly a "Jesse Hate Fight", which brings up the crux of this matter. How far is too far? When does being a sports fan cross the line to sheer madness? It baffles me that somebody could possible justify a hate fight over a sport. I would call myself a cricket fan, that doesn't mean I would ever make it a personal issue regarding international cricketers and I am sure the vast majority fall into this category. It is the minority we have to address here, this is where we draw the line between fan and fanatic. 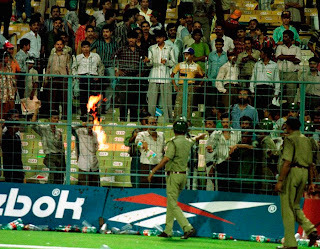 Violence in cricket isn't anything new, we saw the tragic murder of coach Bob Woolmer in 2007 and the Sri Lankan team bus attacked in Pakistan in 2009, remembering that the entire team barely escaped with their lives. We constantly see in India street riots, the burning of effigies, players' homes attacked. What did any of that ever achieve? What drives people to resort to such lunacy over what is after all only a game? I remember when Ryder began his international career as somewhat of a cult hero after batting well against England, on the back of criticism of being overweight from Adam Parore (not exactly known for his wisdom). Then we were hit with the bombshell of Ryder's drinking problems, which I admit tainted my image of his as a sports star. But not as a person. Somewhere along the way we all forget that sports stars are humans too. Sports serves only as entertainment, a fantasy world with gladiatorial like qualities. It is easy to be sucked in and start believing all the on-field drama as reality, at the end of the day it is a game and nothing more. Players get together and shake hands and walk off as friends, only the fans continue to drive the bitter and false rivalry. Ryder is one of us, a mere mortal with very real problems. He simply needed support and care which he got, and was well on his way to making an international return. What happened to him is truly tragic. Hopefully he will show the same power and fight we saw from him on the field. Disclaimer: DieHard Cricket Fans does not own any of the images used. No copyright infringement is intended. If you own anything and would like it to be credited or removed, contact us and we will gladly oblige.